A place to share all the things I love! It sure was a hot one at the flea market today. I was sweating bullets! Sarah was here on Sat. and Sun. to help us and I really enjoyed this extra time with her. She bought me lunch today, and I had a pulled pork sandwich, with coleslaw, chips and pickles for only $5.00. It was so yummy!!!!! I have a touching story to tell about the flea market. A gal was trying on a crochet hat I made, and was looking for a mirror so we had her come up to the front behind the counter where there was a mirror. We told her that she looked so cute it in. My sister thought so too! It was perfect for her. The gal really liked it also and told me that it was just what she was looking for, that she was starting chemo soon, and she said that she wanted to look “normal”. I don’t want to look like that she said, I want to look good. She took that hat and another one in a different style. She said she was going to wear one to work and the other one for other times. She thought the hats were so adorable and told me that I should be at the Cancer Center (in the Rapids). I thought that was so nice and it made me so happy to make her so happy. I asked her name, and I told her that I would pray for her. She told me her name, and thanked me, and said it is not that bad, with all the advance in medicine now, and I agreed with her that it is amazing what they can do now. I wished her the best and they, (she and her husband) went on their way. Tonight we had the whole family together for supper except for Antonio and Zach, and we had a real nice evening. Lenore has a dog named Pepper who is crazy about Mason, and Mason is crazy about him. We think it is because they are about the same height. Pepper is always licking Mason on the face, and Mason runs around squealing with delight. I am sure both Pepper and Mason will sleep good tonight!!! I used several different stamp sets on today’s card: the verse is from Papertrey Ink’s (PTI) Flower Fushion #12, which is stamped inside of PTI Fillable Frames #4 and it was cut out with the matching die. The H is from the Stampin’ UP! 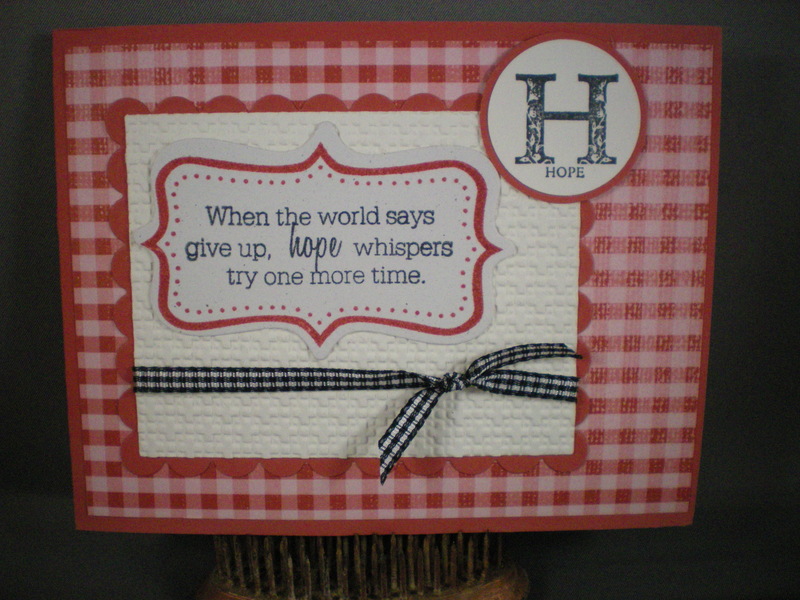 (SU) stamp set: Strength and Hope and I punched it out with the 1 1/4″ & 1 3/8″ Circle punches for a layered look. The white background was embossed with SU’s square lattice embossing folder and it was matted on a scalloped square cut out with a scalloped square nestabilitie die. The card stock is SU Riding Hood Red and some matching retired SU paper. SU black and white gingham finishes off the card.